Hong Kong vampire movies. Until today I had no idea those even existed. Of course, I shouldn't be too surprised by the notion since just about every culture seems to love horror and things that go bump in the night. 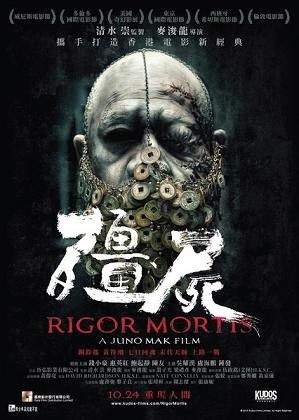 Rigor Mortis is a very strange film. I'm not even sure if I would qualify it as being wholly satisfying, either. It's definitely an arthouse type of movie and a slow-burner. It is a supposed to a tribute to a series of 1980's comedy-horror vampire films called Mr. Vampire, but there certainly isn't any comedy to be found in this particular film. A few of the cast members from those movies can be found in this one, but I'm fairly certain they don't play the same characters. But maybe they do. I'm not an expert on this subject and I don't feel like researching too much. Yeah, I know, I'm being a bad blogger. Honestly, I went into this film completely blind. I didn't know who anyone involved with the film was aside from the producer Shimizu Takashi. Takashi was the guy that directed the four Ju-on movies as well as their two Americanized counterparts. You can certainly see his fingerprints on this movie, too. However, this film is Juno Mak's baby and is a decent film in its own right. Of course, it does help to know a bit more about the movies that inspired it and Chinese folklore regarding vampires. Luckily, we have Google to help us with this. If you need to know more about Chinese vampires then here is a link. I wish I would have done a little bit of reading before I went into this film because there were some things that I just didn't get. Rigor Mortis is very much a slow-burn and at times a bit too slow and muddled for its own good, but it is quite atmospheric and effectively spooky. It doesn't get a lot of good reviews on IMDB or Rotten Tomatoes, but I'm not too surprised by that. After watching it I kind of felt like giving it a bad review, too. But this film isn't designed for Western audiences and Chinese vampires and folklore are very unfamiliar to us. I highly doubt that many people outside of Asian film buffs even know what the Hopping Vampire genre really is anymore. I sure didn't. I've given it a bit of thought, though. And you know what? Rigor Mortis isn't bad at all. Of course, Rigor Mortis could have been quite a bit better, but if you take it for it is I don't think it would be a waste of time. You might even learn some stuff, too.